“I did not have a bad childhood, actually it’s going pretty well.” Damn right it is, and I am grateful. “It is never too late to have a good childhood,” was my next thought. I knew someone else must have thought of that phrase before me and sure enough, Google gives credit to both Tom Robbins and Berke Breathed (most excellent company!) but it seems the credit should go to Robbins. Regardless of who said it first, it is still worth repeating, and repeating, and repeating. Yes! You can be the kid you always wanted to be! So I am here to tell you that you can. Yes. You. Can. And so can I, and I am really grateful! 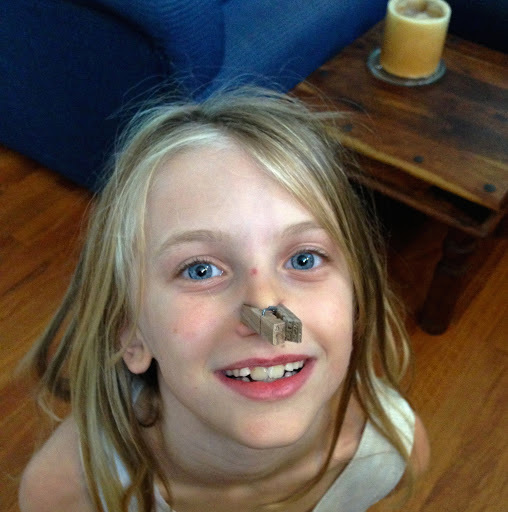 Here is a photo of my granddaughter with a clothes pin (clothes peg) backward on her nose. I taught her to do that.